Do any of the above descriptors resonate with you in relation to the students you teach? As educators embark, or in some cases, continue with the first weeks of a new school year, two types of emotions are usually invoked. One is of excitement, while the other is that of indifference. Excitement because a brand-new school year brings new opportunities for teachers to make a difference in the lives of students. Additionally, for some, there’s the thrill of implementing that new classroom decorating theme found on Pinterest. You know who you are! However, for others, there’s indifference. A lack of interest and concern. Simply, an “I don’t care” attitude. There are myriad reasons for this feeling, some of which may include; heavy workloads and demands that seem to increase each academic year, lack of parent involvement, and challenging student behavior. I don’t know where you stand. My guess because you are reading this is that you want what’s best for students, and although you know the school year will have its shares of ups and downs, you are committed to a cause that’s bigger than you. For you, the statement, “It’s about doing what’s best for the kids,” really is genuine. Your students may not be raised in safe and loving homes that assert the importance of education, both inside and outside of school. Their reality could be going home to grim and dreary neighborhoods. Therefore, some of them will enter your schools with anxiety, anger, and apathy. You can’t control that. What you can control is the quality of education that you provide them during the hours of the day that they are with you. What you can do is exalt their minds and open them up to endless opportunities. What you can take charge of is raising the expectations you have for them. Their social class, parents’ level of education, or race/ethnicity should not determine the level of expectations you have for them. All students are capable of excelling in life. Some students just need that person who is willing to help them discover their hidden potential and show them the strength that lies within them. You have the power to make a positive impact. Regardless of trials and challenges that you will face this school year, you can make a difference! Click Here to Contact A.C. for your Next Event! 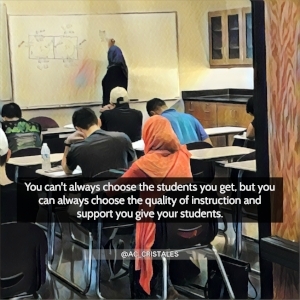 Posted on August 31, 2017 by A.C. Cristales and filed under Blogs, Education, Leadership, Leadership Tips and tagged power empowerment school leadership teachers impact motivation education educational leadership students student empowerment. As a speaker and writer, I do my best to learn what makes the “great ones”—orators and authors of the world renown—great. I study their speaking and writing styles, their word choices and use of language, their presentation skills and means of grabbing and maintaining the attention of their audiences. More than anything else, however, I study their lives, specifically the obstacles and trials these men and women had to overcome on their paths to success. What I glean from my examinations I integrate into my own life because, if there is one common thread of human character that links the past, present, and future, it is our ability to persevere. JK Rowling's most famous book series. As evidence of this, consider the example of a poor, single mother who once lived on welfare. Divorced and jobless, she had been diagnosed with depression and had even contemplated suicide. Then, while taking a train trip one day, she had an idea for a novel. She worked on her book in local cafes while her baby took naps in the stroller. Once her manuscript was finished, she submitted it for publication; it was rejected countless of times before a publishing house finally accepted it. This woman’s birth name was Joanne Murray, but today people the world over know her as JK Rowling, author of the Harry Potter series. In a commencement speech at Harvard, Rowling mentioned something about failure that I believe is very relevant for us to truly understand and grasp what perseverance means. Rowling did not allow her difficulties to keep her mired in poverty, but rather endured them and, as a result, became the world’s first female billionaire author. She is literally living the “rags to riches” fairy tale, all because she chose to persevere rather than surrender. Struggles in life are unavoidable. As surely as the sun will rise, they will come. Some may batter us so badly that we will want to give up on everything we have planned, but that does not mean we must allow them to steal our hope. We can instead choose to see our trials simply as steps we must take along the path to greatness. Remember this: You always have a choice; persevere or surrender? The great ones; leaders, entrepreneurs, teachers, students, artists, etc. know that greatness comes because they choose not to give up on their mission. Posted on March 30, 2017 by A.C. Cristales and filed under Blogs, Life Success Tips, Leadership Tips and tagged JK Rowling Harry Potter Greatness Great Leadership Success success tips Perseverance choices. and that reason is not to keep you from what you want to achieve. They exist to reveal how much you want something, to determine whether or not you want it badly enough to endure whatever it takes to earn it. I understand that this will not be easy. I have certainly had days when I woke up and, even though the sun had risen and shone through my window, I could not see it because the shadow cast by the difficulties I was facing loomed far too largely. In those moments, life seemed bleak, and my vision for the future was blurred. Amidst those temporary lapses, however, my belief that the grandest things lay just on the other side of my tribulations, urged me to hold on...to stand by my purpose. What great things will you accomplish if you just hold on tight to your dreams? Whose life will you impact today if you truly grasp the great opportunity that is in front of you? How will you impact those around you knowing that you are here for a greater purpose? Don't let your mission in life be derailed by failure, criticism or discouragement. Posted on February 16, 2017 by A.C. Cristales and filed under Blogs, Education, Leadership Tips, Life Success Tips and tagged purpose Leadership mission mission-driven failure encouragement inspiration motivation challenges endurance Perseverance personal development. Some of you are a couple of weeks into another school year. Has the excitement of a new school year already vanished? Are you counting down the days to Thanksgiving break? Perhaps the answer to the above questions is a resounding “Yes.” If that’s the case, is it fair for me to assume that the reason why you may be feeling a bit dejected is because the students have switched gears on you? No longer are they the sweet, quiet kids. Now, they are testing you and your limits. Now, the lesson you worked hours and hours on during the weekend creates little to zero engagement with them. To top that off, maybe your calendar is filled with deadlines from administration of paperwork that must be completed ASAP. It’s no wonder, right about now you’re probably feeling down. I feel your pain. I’ve been there. Maybe you don’t work in a school environment at all, but you’re experiencing discouragement because your business isn’t taking off the way you envisioned it to. Regardless of where you find yourself, allow me to offer you two pieces of advice. 1. Don’t quit. Yes, it sounds elementary, but perseverance is a quality we love to claim we have until we find ourselves facing a huge obstacle that reveals to us otherwise. However, any successful person succeeded not because he or she always did the right thing. Rather, it was because he or she stayed committed to their purpose. Countless times they failed, but they always rose back up. 2. Win Their Trust. Realize that the people you are trying to influence will not listen to you or give you the time of day, until they are able to trust you. The relationship you have with the people you are serving matters. It matters because it influences the results you are getting and will continue to receive. In a study conducted by Mensah and Atta (2015), teachers expressed that a supportive relationship with students was one key factor that inspired the students to succeed. So, continue to get to know your students. Value them. Not just when it’s convenient either. For those in business, the relationships you build are also vital to your success. Get to know your potential clients. Treat them with respect. Provide them value. Build trust. Remember, any person will work with you and for you when they trust you, and that the strongest of all relationships is always built on trust. 2. Your communication both verbal and nonverbal matter. Choose both words and actions carefully. 3. Value every single person you are serving, whether they treat you fairly, do the right, or not. Here’s to you staying Mission Driven and creating a legacy that makes an impact! Posted on January 30, 2017 by A.C. Cristales and filed under Blogs, Leadership Tips, Success, Education and tagged leadership education mission legacy trust relationships business leadership educational leadership Perseverance. As we get older, our days seem to become shorter than they once were. Our responsibilities consume so much of our time and energy that on occasion there simply are not enough hours in the day to attend to them all. If we focus too intently on these activities, we can easily miss others that do not fit into our established routines. At other times, we may ignore things outside the realm of what we find comfortable, choosing instead to maintain the status quo because we do not want to disrupt the practices we have become accustomed to. Still, at other times, we may fail to recognize the opportunities that arise because they do not come in the manner we expect or because, on the surface, they look far too much like work. It is possible for us to spend so much time in expectation and preparation for what may come that we actually miss the very things we are waiting for until they have passed well beyond our grasp. The truth is that far too often we allow opportunities to remain unclaimed when they should, in fact, be fortuitously seized. What opportunities can you seize today...will you seize today? Sure, there are not enough hours in the day, but how can you maximize the time you have been given? What activities can you do without? Which undertakings are you working on that are not really benefitting you? Those things that do not help you will eventually hurt you. It may not be today. It may not be tomorrow, but that which does not bring out the best in you will always be a hindrance to your success, both personally and professionally. Opportunity knocks. However, if you feel like opportunity is missing your door for whatever reason, it does not mean that this is the time to complain. Rather, this is the time to create your own opportunities, and opportunities are created when you step into motion. You cannot expect opportunities to arrive if you are not putting yourself, your faith or your work into action. Today, don’t get derailed. Don’t be discouraged either. Your destiny awaits. It may be delayed, but it is definitely not denied. What opportunities will you seize or create today? Share them in the comments. Follow A.C. on the following social media sites. Posted on March 16, 2016 by A.C. Cristales and filed under Success Principles, Leadership Tips, Life Success Tips and tagged opportunity success destiny new day seizing opportunity.